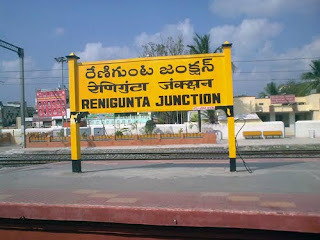 Renigunta junction is located in the Chittoor district of Andhra Pradesh, near Tirupati. Renigunta station was set up to lessen the traffic at the Tirupati junction, as an alternate set up. This busy junction comes under the jurisdiction of South Central Railways at Guntakal junction. Station code: RU. Renigunta is a commercial town that also hosts a railway carriage repair center. Nearby tourist spot is Tirupati at about 10 km. Renigunta railway station connects many major cities such as Mysore, Mumbai, Chennai, Howrah, Bhubaneswar, Delhi, Nagarcoil, Trivendrum, Bangalore, Tatanagar, Bilaspur, Secundarabad, Kanyakumari, Jammu Tavi, Mangalore, Tirunelveli, Kochi, Patna, Kolhapur, Hyderabad, Puri, Visakpatnam and Pondicherry. Major trains running through this station are Howrah-Mysore Special, BBC-TPTY special, Chennai Mail, Mumbai Mail, Nizamuddin Express, Kerala Express, Swarna Jayanti Express, TATA YPR Express, A P Sampark Kranti, and Himsagar express, Navyug Express. Renigunta station is well connected to many cities of Karnataka, and Andhra Pradesh by passenger trains running daily.